My name is Roy Bennett and my lovely wife is Ruth. They call us Pastor or Preacher Roy and Mama Ruth. We have two children, Amy married to Heath Frazier with three children, and Aaron married to Denelle with two children. We are proud of them as they are all Christians serving the Lord in their local church. We have been called to Bikers for Christ to serve since 2002 and we couldn’t be happier with what we are doing in our lives. 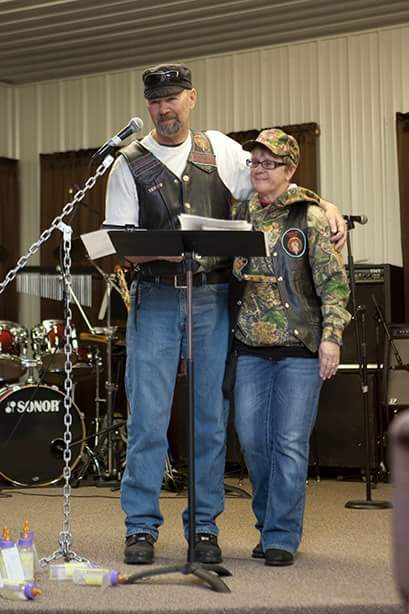 We serve as the Midwest Regional Elder consisting of six states and set on the National Board for Bikers for Christ. We enjoy the relationships that we have been blessed to create through the years and look forward to new relationships and invitations to new clubs and ministries. There is nothing better than being able to catch some wind, preach the Word of God and be there as a steward. We are open and available to preach, visit your clubs, do funerals and be there for you if you need us. May the Lord bless you abundantly and prayerfully we will meet on the road, rally or club sometimes. If not, just meet me in heaven as that is where my ride will end someday.